This INVERTEBRATE inhabits the upper level stream passages of the cave. We ask you to keep your cave exploration to the active stream passage, so this spider has a chance of survival. 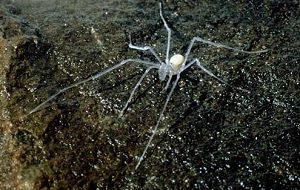 It is extremely slow moving, inhabits the floor areas, and its body is translucent enough that it cannot be seen readily. Harvestmen have only one body segment, no venom and no silk production. They eat small invertebrates like collembola and mites. 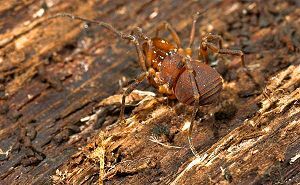 They cannot immobilise their prey with venom, they only hold them in their modified palps. Description : Body : 6mm, overall 40mm, light pigment, modification of tarsal segments on first 2 leg pairs, legs very slender. Entomology Report : Forster. Rec. Otago Mus. Zoology, 2, 1965. Held Otago University Entomology Dept. Last recorded sighting : 1963 in high lower entrance profile (dark zone).1997 in upper stream passage (only 2). Similar occurrence : Punakaiki roadside caves, possible species variation.